Amid rising competition between automotive and IT companies to take the lead in securing autonomous driving technology, consumers expressed more trust in self-driving technology developed by conventional automakers, a survey showed Sunday. Out of the 5,045 people surveyed across five countries -- the US, the UK, Italy, Germany and France -- 30 percent answered they trust autonomous driving technology put together by auto firms, according to the survey complied by Inrix, a US-based connected car services and transportation analytics firm. “Consumers showed a tendency to trust conventional automakers based on familiarity. This is because self-driving technology is not yet complete, and has room for improvement,” according to Inrix. Next up on the list of trusted self-driving technology developer were IT firms, such as Apple and Google, backed by 20 percent of respondents, while 9 percent answered they would not trust autonomous cars at all, the survey showed. The market for self-driving cars is expected to reach $42 billion by 2025, according to US-based global consulting firm Boston Consulting Group. It is also anticipated to stand for one-fourth of vehicle sales worldwide by 2035, said BCG. Conventional automakers, for now, are seen to have an advantage over rival industries in producing affordable self-driving cars. “The era of autonomous driving is just around the corner. However, lowering the cost of technologies related to self-driving, in particular lidar sensors, is a key hurdle in popularizing self-driving vehicles,” said an official of a local auto parts company. 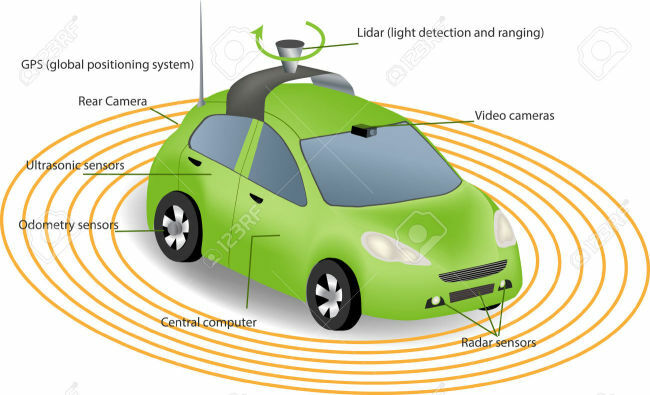 Lidar, or light detection and ranging sensors measure the precise location of objects and humans surrounding the vehicle. They are essential in self-driving vehicles. “IT firms have so far headed the development of lidar sensors and autonomous driving technologies. Conventional automakers, however, seem to have an upper hand in lowering the cost of lidar sensors due to economics of scale and familiarity,” he added. Hyundai Motor, South Korea’s biggest automotive company, is striving to develop autonomous cars with an affordable price tag, along with a standard platform for autonomous cars that is accessible to the public. “Automotive companies working on autonomous cars are trying to secure self-developed autonomous technologies. Hyundai Motor is putting in all efforts to release mass-produced low-price self-driving models,” said Lee Jin-woo, the head of Hyundai Motor’s Intelligent Safety Technology Center. Lee added, Hyundai Motor is willing to cooperate with related IT and auto parts companies to hasten the day they introduce autonomous cars at a low-price.